(Laguna Niguel, Calif.) –Demonstrating strong support in Laguna Hills, four Laguna Hills councilmembers have endorsed Anna Bryson for the 73rd Assembly District. Laguna Hills Mayor Andrew Blount, Laguna Hills Mayor Pro-Tem Dr. Dore Gilbert, former Mayor and Councilmember Barbara Kogerman and Councilmember Melody Carruth have joined Anna’s impressive list of community endorsements. Bryson is a small-business owner and education reformer. While she has been serving as a trustee for the Capistrano Unified School District, it has become the top-performing large district in the state. As a trustee, she has prevailed in starting and maintaining five charter schools. She also successfully voted to save local residents $59 million in taxes. Bryson volunteers in the county D.A.’s anti-gang program where she makes use of her fluent Spanish. 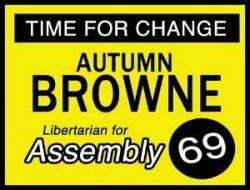 For more information and a complete list of endorsements, visit www.annabryson.com. They must be totally nuts ! She sounds very capable on some issues, what is this deal with her wanting toll roads on I-405? I can’t imagine what she’s thinking in that regard.